Preamble: Woke up got out of bed, that was a good way to start the day. With so many events on the 11th of June, there were all the conflicting choices and no handy dandy DeLorean and flux capacitor. The Derby Debs were hosting Rideau Redux with the Riot Squad at Ted Reeve, Royal City Rollergirls had their Royal City Riot with first time South Simcoe facing Killer Queen and Our Ladies of Pain going up against Violet Uprising, Toronto Roller Derby had their 2 vs 3 semi-finals with Chicks Ahoy! 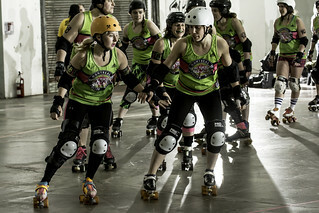 meeting the Dolls in their second bout in two weeks. Mais les jeux sont fait with Hammer City Eh! Team facing the Hammer City Eh! Team. 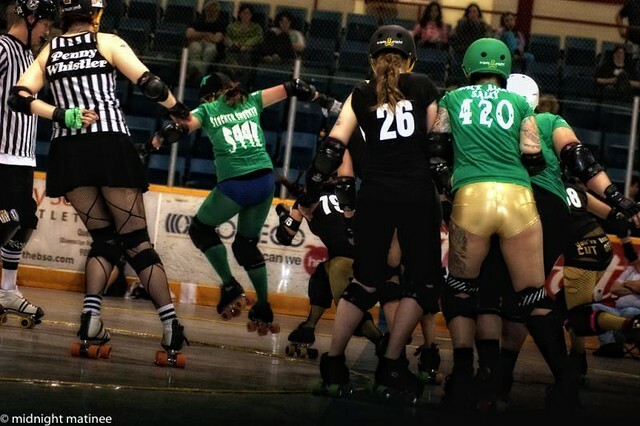 Hammer time in the city as the Lake Effect Furies brought their brrrr! game to Hamilton. It was storm und drang as the Hammer City Eh! 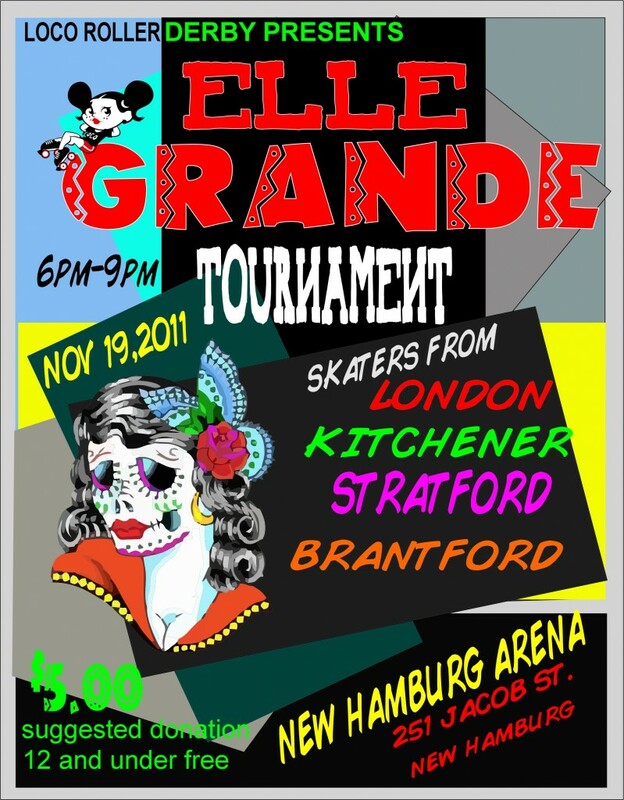 Team led by mainstays Bitchslap Barbie, Lock and Eduskating Rita fought back with their classic hit and run style. The travelling Furies from Queen City Roller Girls in Buffalo, New York ventured across the border with a squad of eleven captained by #52 CU-T and LipService wearing #77 instead of her customary #360, some rookie Furies #303 Konichiwow and #711 Day TripHer with their new coach in tow Mr. T and Diamond Crushher running bench. 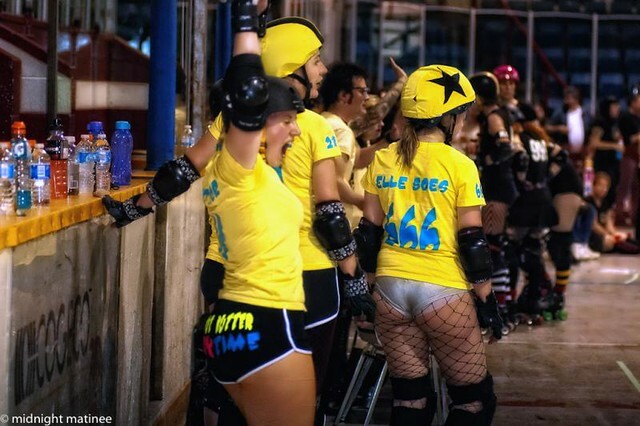 The Furies ranked currently #17 in Q1 in the Eastern Division in their first year of WFTDA are nothing if not new Derby on the edge of a revolution. Meanwhile ranked #19 in Q1 Hammer City Eh! Team were into their second bout of the home season while the Furies had already been busy at home against Steel City, Hudson Valley and Maine, and on the road against the likes of Green Mountain and Montreal New Skids on the Block, and the QCRG home teams just finishing off the Queen City Cup championships won by the Devil Dollies over the NCKO. 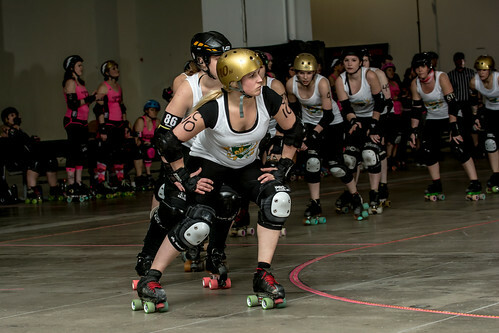 The match with Hammer City would be QCRG’s seventh ranked match of the year whereas Hammer City would be back from BrewHaha 2011 and their part in the doubleheader with Forest City. 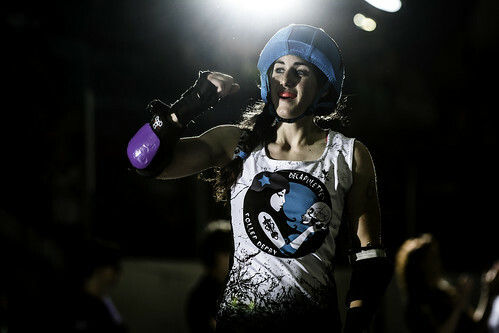 From the moment the Furies skated onto the track, they brought their style and fluidity in skating that showed they meant business. 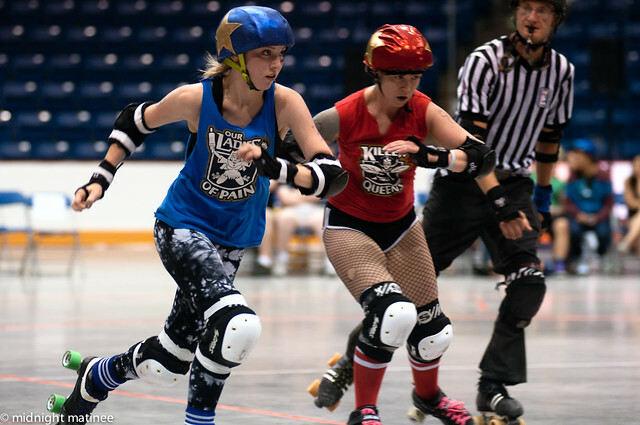 The Furies have demonstrated in the past through two matches in Ontario with Tri-City Thunder and CN Power they have defence and speed. And their coach Mr. T had brought in some track savvy and wiles. It also became apparent during their speedy and fervent warmup that the Furies had something up their sleeves [if they had been wearing any]. 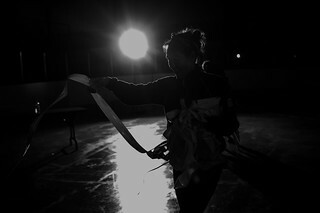 One of the elements of surprise was a manner of skating which is not commonly seen in Derby but taken to the heart and actively encouraged within Queen City. 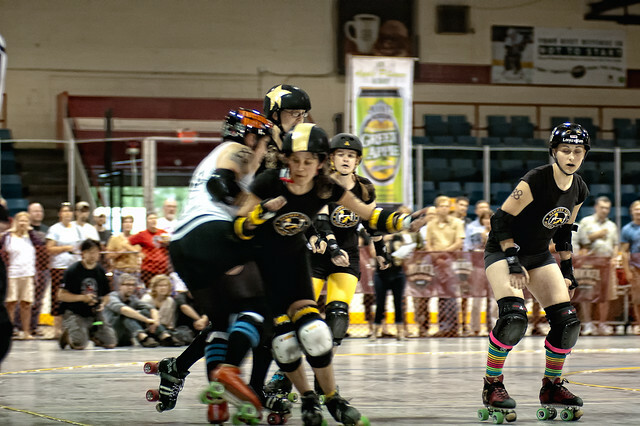 The bout was as swift yet defensive and hard hitting as could be imagined by any fan of the Hammer or the Furies. The gameplan by the Furies was a sight to behold. 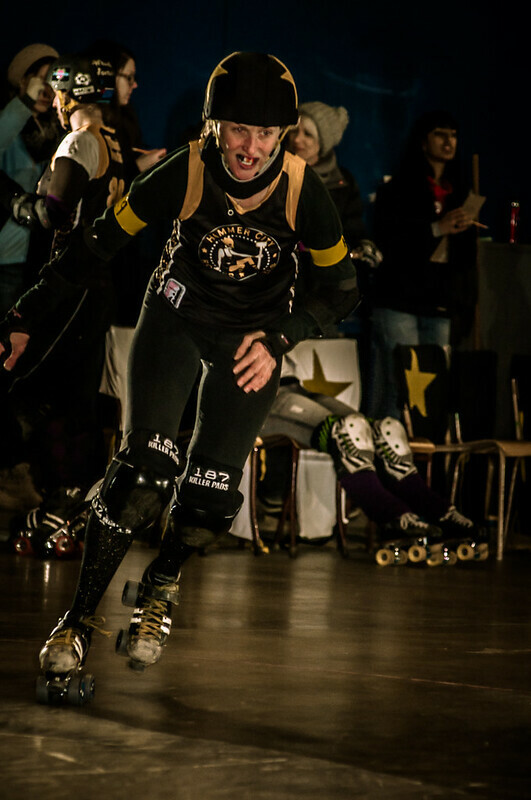 Trying to keep it on the mum side, Lake Effect Furies ploy of backwards skating and blocking as shown by their #44 R. Rose Selavey nonetheless looked revolutionary, then again, anything involving players in Derby on the track is revolutionary. 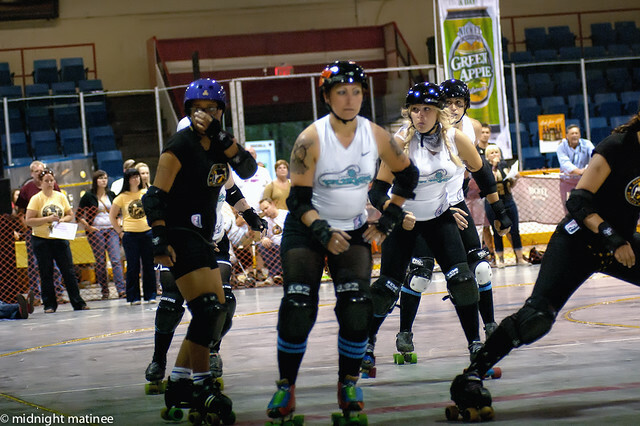 Backwards skating and blocking in the direction of play may not be prevalent, but it is a tactic that could be incorporated. The advantages are within the realm of the teams themselves. 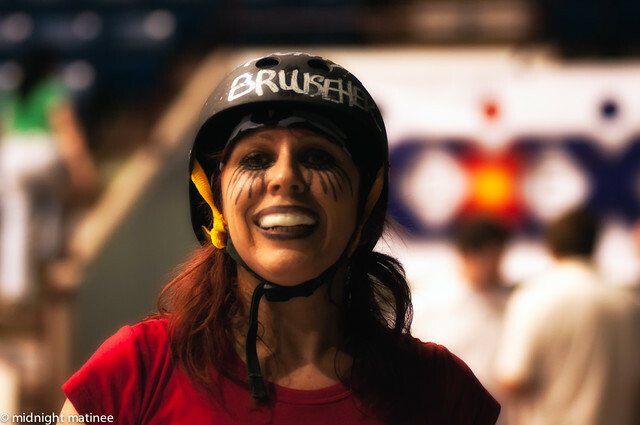 Wily Lambchop #71 of the Furies always eyeing out her opposition, delivered the hit of the night for her team on an unsuspecting Oh! Henry, while Miss Carriage countered in kind for Hammer. One of the nice parts of Derby is the afterwards picking of the MVP by the two sides for the night. The Eh! Team chose #711 Day TripHer as Lake Effect’s MVP, while #5150 Oh! Henry was chosen as Eh! Team’s MVP by their Queen City counterparts. This thrilled #5150 no end. 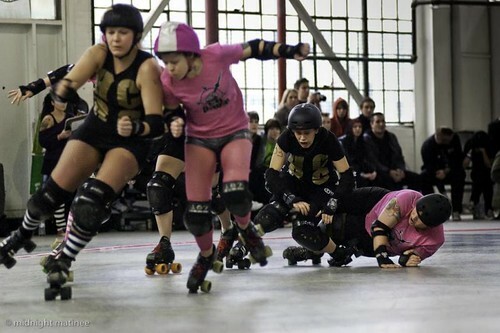 Next matches to come for Hammer City slotted against Maine and Long Island down at East Coast Derby Extravaganza. 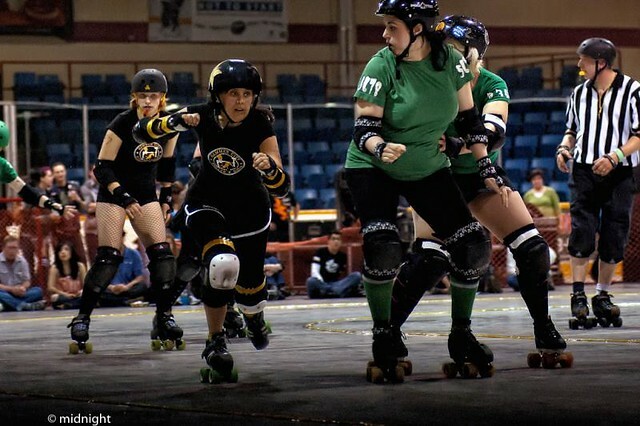 Then July 9 back at home with Roc City currently WFTDA Apprentice. 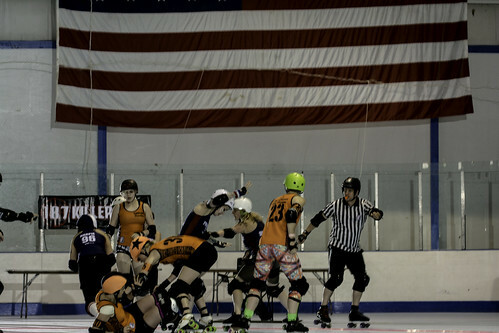 Roc City have played previously against Suburgia, Lehigh, Long Island and QCRG, with future bouts against Garden State, Lake Effect and Harrisburg. 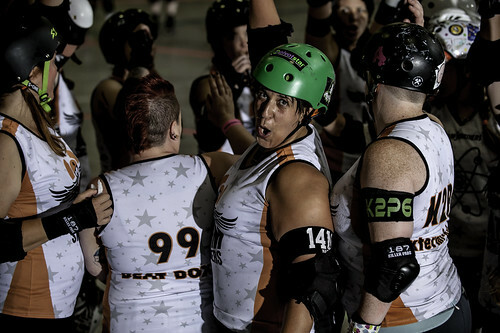 As we write this: Lake Effect Furies have just defeated Central New York 152-135 on June 18th. Cheers!